The opening, title track at first sounds like a typical minor-mode hard-bop flagwaver. 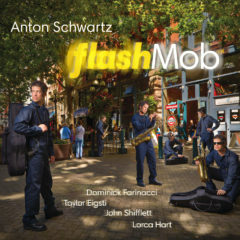 But pianist Taylor Eigsti accelerates his solo to a furious tempo with bassist John Shifflett and drummer Lorca Hart weaving a dense pattern of counter rhythms alongside him. Eigsti lays down a beautiful variety of patterns before Schwartz’s solo takes things down for more spare ruminations. Schwartz also knows how to leave space in his songs. “Cumulonimbus” changes shapes by alternating a rubato theme with a driving 3/4 bridge, and offers a short, rhapsodic unaccompanied passage from Eigsti. On the slow blues “Alleybird,” trumpeter Dominick Farinacci takes the first solo with just bass accompaniment before Eigsti joins in and the piece assumes a gospel fervor. Just about all of these songs have the kind of shapely themes you can imagine other players wanting to cover. In fact, Schwartz’s tempo-shifting “Spurious Causes” is a good match for “La Mesha,” the Kenny Dorham ballad that follows it. There are other pleasures, such as the complementary styles of Schwartz and Farinacci, the former ardent and gritty, the latter dark-hued and lyrical. But for everybody here, the tune’s the thing. Which is another good lesson from hard-bop.